Last Saturday I went back to Zhenjiang, the old vinegar town on the Yangtze. My friend Gwen and I spent the day exploring the old streets around the former British Consulate, which were as charming as I remembered from my last visit two years ago. 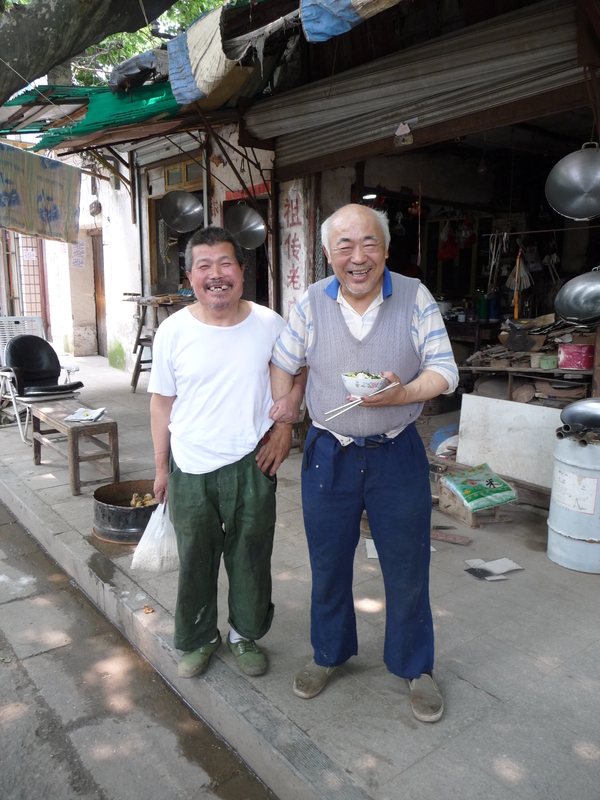 I was particularly happy to find that the woksmith was still there, in his old workshop, running a business that has been in his family for more than a hundred years. It’s incredibly unusual to see such a shop these days, and especially to be able to watch the red-hot woks, fresh from the furnace, being hammered into shape. It’s also pretty unusual to return to anywhere in China after a two-year absence and find that it hasn’t changed. Apart from the woksmith, the avenues of wutong trees were still there, casting their shade over the road, as was the shop where you could buy singing crickets in their tiny openwork bamboo cages. But, almost inevitably, we discovered that the whole area is due to be demolished in the next couple of months. 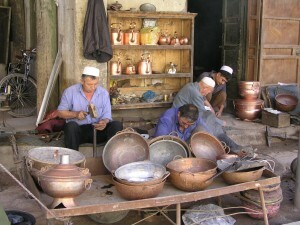 The woksmith, along with his neighbours, will be moved away to another district. As he is clearly close to retirement age, I’m guessing that will be the end of his business. 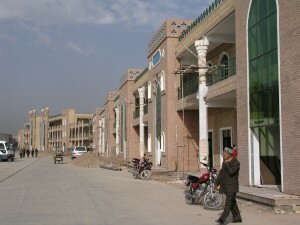 Of course this made me sad, but not as much as the news that the Xinjiang government plans to demolish 85% of old Kashgar. 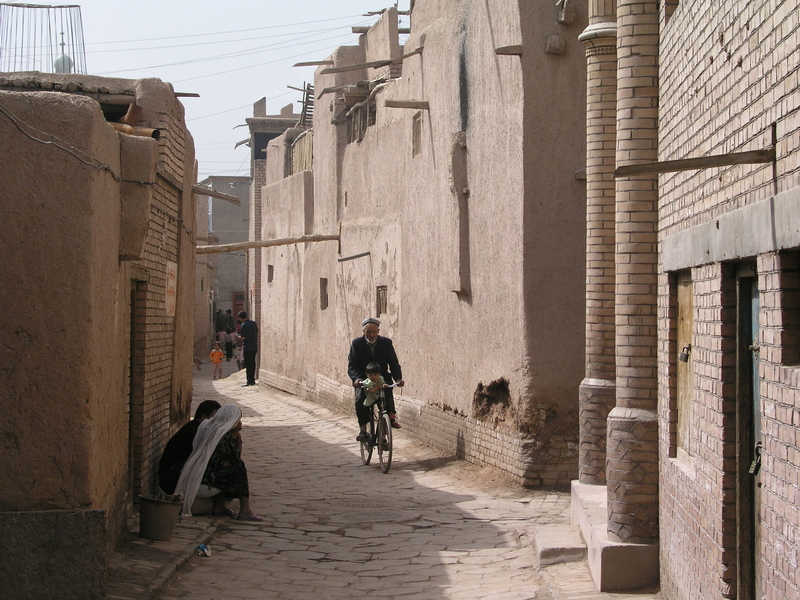 I have been to Kashgar twice, once in 2002, and once in 2004, and it’s a fascinating place. 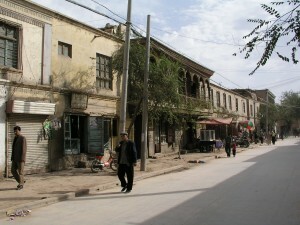 Despite the bland uniformity of the new Chinese town, the old Uyghur quarter held much of its magic. 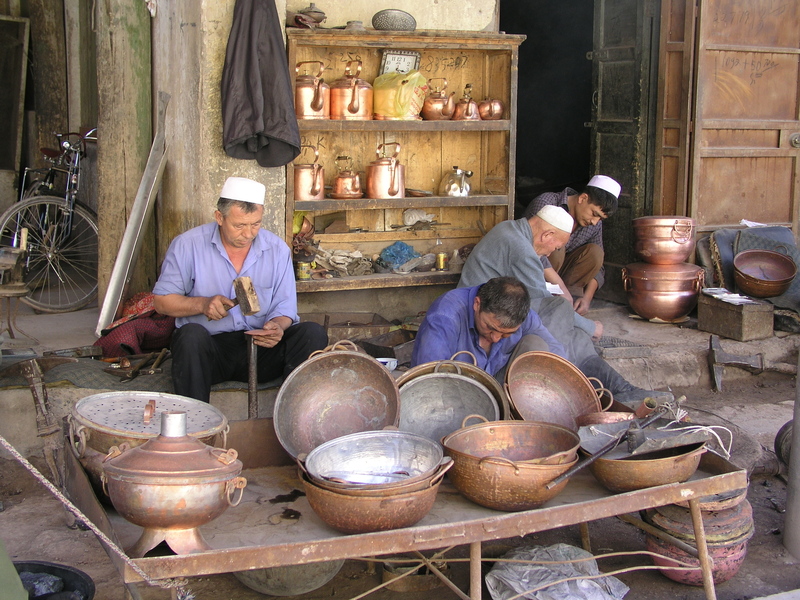 There were markets and teahouses, craftsmen hammering pots out of copper and carving wood on a lathe. After all the atrocious mistakes made in China’s development over the last fifteen years (not least the total destruction of old Chengdu, including the last two old lanes, Kuan Xiangzi and Zhai Xiangzi, which have been ‘preserved’ by a total rebuild in an inapproprate style, and the incorporation of international chain stores including, incredibly for anyone who knew the lanes as they used to be, a Starbucks), I still find it hard to believe that the authorities would do anything so stupid in Kashgar, if only because it has the potential to be a lucrative tourist destination for them – and I can’t see anyone wanting to travel that far across the desert to see concrete buildings finished off with a few touches of what I call ‘Islamoiserie’. But I suppose the writing has been on the wall for some years – they had started knocking down bits of the old town when I last visited. It was another of those moments when I felt so upset that I wanted to leave China immediately and give up on the country. It’s heartbreaking to see the ruination of yet another irreplaceable cultural treasure, and I just can’t understand the mindset of the people who do it. I heard the news in an email that arrived just before I left to meet some friends for dinner, and I was in such a bad mood that I just had to talk about it, to explain the clouds of thunder that no doubt hung over my demeanor. My Chinese friends sympathised, and said they agreed that the decision was regrettable, but they were also apathetic, as one might be after having lived through the aftermath of previous attempts to challenge the system (I’m writing this post, of course, on 4th June). 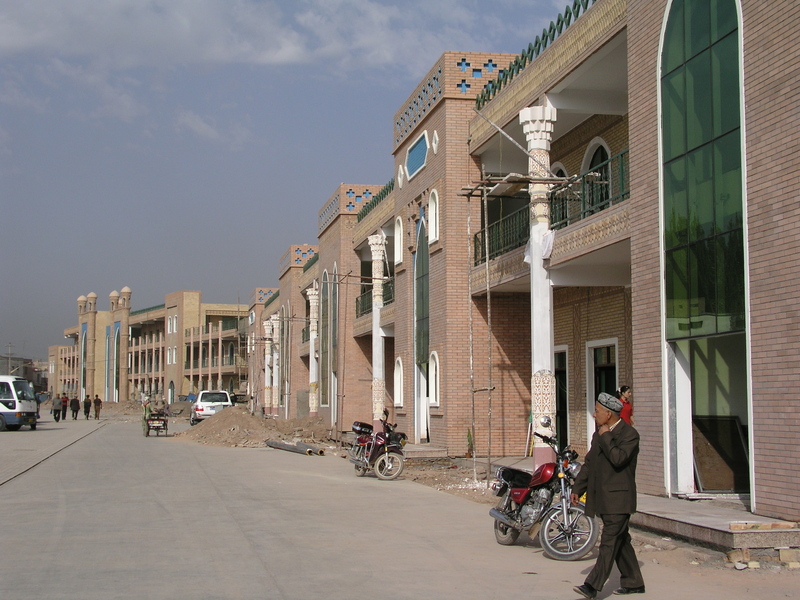 But I don’t think they are duped – one woman I talked to privately later on was sceptical about the official explanation that the town will be razed ‘to protect people from earthquakes’, and thought it more likely that the reason was a desire to Han-ify the region. Anyway, I’m still here, somehow. Hi Fuchsia, Great post. Sad that people can’t recognise what they’ve got until after it’s long-gone (if ever). I just finished and thoroughly enjoyed Shark’s Fin & Sichuan Pepper. It’s by far the best book I’ve read on Chinese food and travel–so full of insight and refreshingly free of cultural platitudes that plague writing on China. 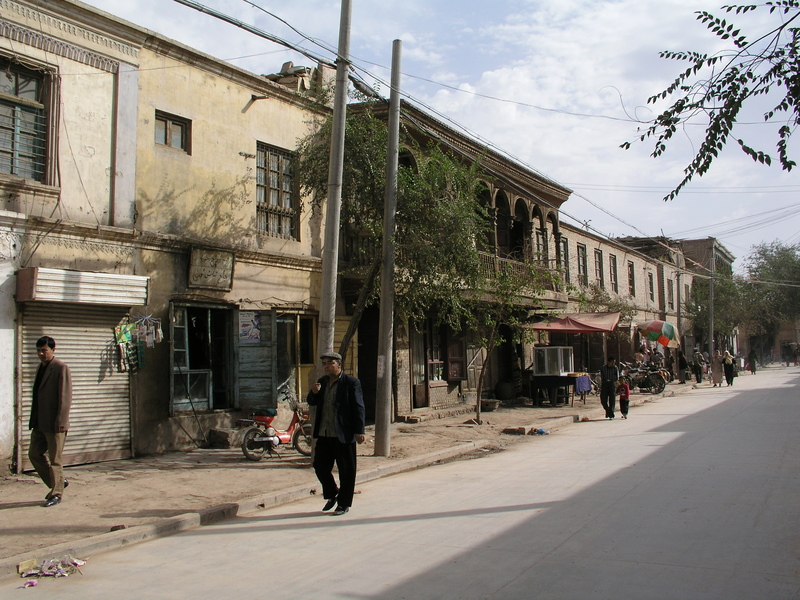 On a language immersion program in Shanghai in Summer 2007, some of my most memorable times were spent wandering old neighborhoods soon to be demolished–a respite from relentless urban redevelopment and endless review sessions. Later, when I took an undergraduate course on urban planning, I couldn’t help but draw parallels between current urban development in China and the Le Corbusier-style, automobile-centered urban housing ideals that pervaded the US and Western Europe in the 30s and 40s. It seems to me so much more culturally and demographically appropriate for China to avoid the mistake of remapping cities to suit the automobile and invest more seriously in neighborhood renewal and high-density mass transit. I also work in the Chinese food industry and events like this prove extremely challenging for me to tirelessly promote the beauty and diversity of Chinese cuisine and culture. 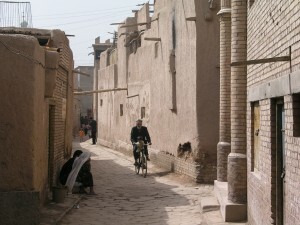 It is statements like this ‘No archaeologists monitor the razings, he said, because the government already knows everything about old Kashgar’ that frustrates and shows the disconcern of to the obvious heartwrenching loss of culture. Being a frequent visitor to china I share Fuchsia’s sadness at the seemingly senseless destruction of old cities in China. I only went to Chengdu last year for the first times and there were only hints and odd reminders of perhaps what it once was. I regret I never got there 10 years ago. 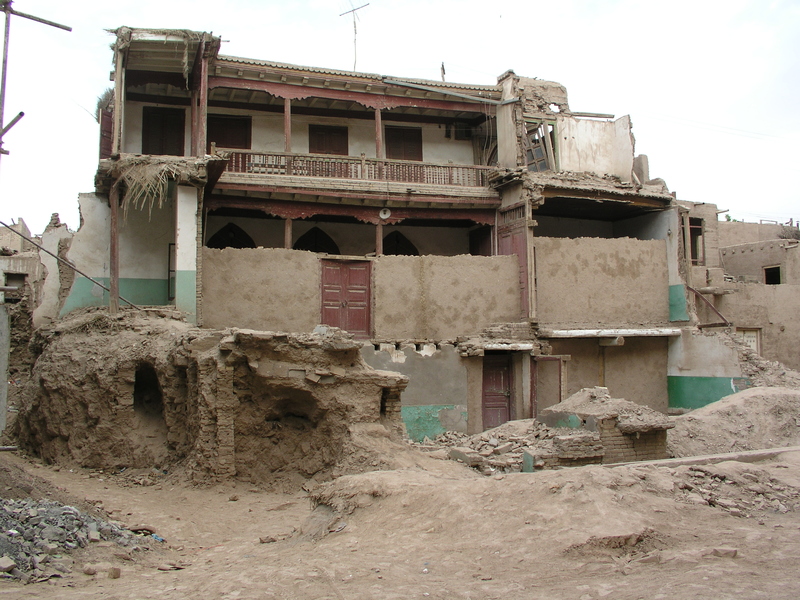 I visited the four major designated “old city” areas in town and found them disapointing. All fake new buildings and nearly all the shops sold tourist tat. 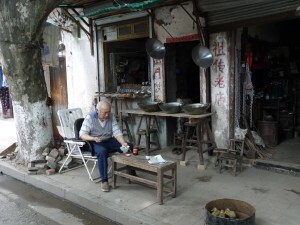 If only there was a genuine hand hammered wok maker like the old fellow in Zhenjiang set up there. I would gladly have bought a wok or two to take home. I did manage to get to Kaifeng which to me appeared much like Fuchsia’s description of how old Chengdu was. Perhaps one of the few cities which still express the charm of old China remaining. BTW I am pleased to say that out of my entire collection of six cookbooks, three of them are Fuchsia’s works. They have a selection of traditional hand made Chinese cooking products such as woks, Sichuan cleavers, copper ware, utensils etc. They are not cheap compared to modern machine made products but still far cheaper than fancy high end wares as sold in western kitchenware shops. I have one of their handmade woks and am extremely pleased with it. will last a lifetime.